Some of the most popular phone scams involve criminals on “phishing” expeditions, looking to trick people out of credit card and bank account numbers by claiming to be from the credit company or financial institution and updating records or calling about a nonexistent “problem” and needing the account number to “verify the account.” No legitimate company or institution will call customers and request account numbers over the phone. 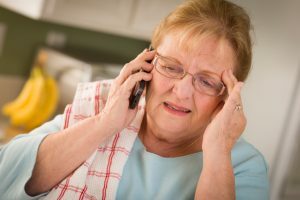 Seniors are especially vulnerable to something called the “grandparent scam.” This involves someone calling and claiming that a grandchild has been kidnapped and the grandparents must pay a “ransom” to win their release. In some cases, the criminals know something about the grandchild which helps fool the victims. Another major phone fraud scheme revolves around phony lottery or sweepstakes winnings. Criminals will call seniors and claim they have won a major prize, but must pay a “processing fee” or “prize transfer cost” — often running into the hundreds of dollars — to collect the bogus winnings. No legitimate marketer or agency would require a contest winner to provide a payment to secure their winnings. Phone fraud criminals also like to impersonate IRS agents and claim that the unsuspecting senior has an unpaid tax debt that must be resolved immediately with a payment over the phone to avoid “legal action.” The IRS will always notify taxpayers in writing of any issue with a filing or payment, never by telephone. This particularly aggressive phone scam has been around for years and continues to pop up every year, especially around tax time. Anyone who suspects they’ve receive such a call should never provide any information or payment over the phone and instead call the toll-free IRS hotline at 800-829-1040. With just a little vigilance and common sense, we can help protect our seniors from these and other nasty phone fraud schemes. If your senior family member or other loved one uses the phone and may be easily tricked, we recommend talking with them about these and other common phone crimes to help them preserve their money and peace-of-mind. This entry was posted in Caregivers, Tips and tagged phish, phone fraud, scams, seniors. Bookmark the permalink. Both comments and trackbacks are currently closed.